The choice of packaging is the ultimate brand statement. It is important to take the time to carefully choose your packaging to compliment both your products and your brand (company). We at Noble believe there are two fundamental aspects to choosing packaging. First there is the physical function, which in fact simply protects the product. Then there is the psychological function which is linked to consumer appreciation, and that is the one you have to get right! Luckily, at Noble we can help you with both these aspects by offering a wide variety of classic and innovative packaging products. Companies continuously strive to showcase their brand. An ideal way of doing so is by repeated exposure of your company. By personalizing your packaging with your own unique logo, consumers will begin to identify with your particular image. Your company’s products and/or services will create an impression with customers and your branding will solidify this impression. This brings us to the importance of creating a business logo that defines your company and its products. As we all know, a business logo is an essential part of a company's identity in the market. So whether you’re starting a new business or looking to revamp your image, our professional logo design team will help you embody the identity of your business with a custom designed logo. Now that you have an identity, why not use it to promote your company by incorporating your logo into your packaging. If your company offers a product, be sure your logo is prominently represented on the packaging as this contributes to exposure for your brand. 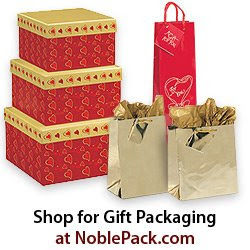 Here, Noble offers you many options to choose from; print your logo on bags, gift & clothing boxes, ribbons, labels, tissue paper, garment bags, jewelry boxes and more. Nothing can match the convenience and style of bags. 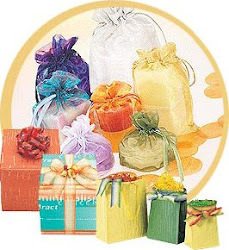 Gifts bags are an excellent option for most business. Choose from our wide selection of paper or plastic bags, add your designed logo and voila we have just helped you to create a silent salesman for your business. Take part in the green movement with Noble’s new collection of ZeroTree bags and benefit from two great advantages. First, your customers will appreciate your commitment to the environment. Second, these bags are reusable; therefore they will keep on promoting your brand long after the initial sale. Customized labels are an ideal and cost-effective way to promote your brand while adding a unique look to your packaging. We offer a wide range of sizes and shapes, available with either economical ink printing or luxurious foil printing. Definitely think outside the box; for instance, if you use tissue paper, why not order some imprinted with your logo. Noble can help with its acid free tissue paper available in a variety of colors. Our selection of ribbons adds that elegant final touch to your customer’s purchase. Print your logo on our double face satin, satin acetate or flora satin ribbon to compliment your packaging with a polished look while creating more exposure for your brand. 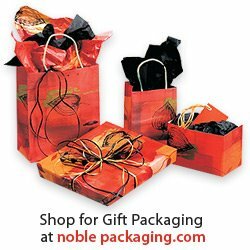 With most of our printing done in-house, you can count on Noble Gift Packaging for quick delivery. Our minimum quantities are available to all businesses: big or small. We can provide you with the best in low cost advertising with our wide range of quality personalized packaging. So increase customer awareness and ensure consumer satisfaction by having Noble Gift Packaging take your business image to the next level. As we all are that to promote our brand the first and the foremost thing is to have good packaging criteria on a product as much attractive the product packaging will look the much more promotion a brand will have. So be sure that you have the best packaging product and than see how your brand goes to the much more up gradation and promotion. Welcome to Noble Gift Packaging’s blog. We will use this blog to keep you updated on new products, trendy packaging, and promotional items. This will be a place where we will have the chance to share our knowledge and experience with our customers, by offering them expert packaging & gift wrapping tips. We will also keep you in touch with interesting articles that may be of concern to the wholesale and retail industries. This blog was especially created for our customers, so please don’t hesitate to send us your comments, feedback, and suggestions.